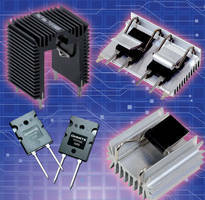 Heat Sinks suit high power density applications. Measuring 2.2 in. across x 1.71 in. tall, MV/MA 302 Series uses 2 internal spring clips for mounting up to four TO-247 or TO-264 devices, eliminating need for mounting holes and screws. Units are constructed of aluminum alloy 6063-T5 or equivalent with either degreased or black anodized finish. Four models are available with thermal resistance of 6.0, 5.2, 3.6, and 3.0Â°C/W. Arlington Heights, IL - Designed for applications requiring high power densities and where forced air cooling is present, Ohmite has released a larger version of their MV/MA heatsink which provides even more heat dissipation. The longer, more efficient fin extrusions on the new version give nearly twice the thermal performance as their smaller MV/MA 102 product. The MV/MA 302 heatsink is 2.2" across by 1.71" tall and uses the same installation mechanism which provides two internal spring clips for mounting up to four TO-247 or TO-264 devices. The convenient spring clips eliminate the need for mounting holes and screws, are resilient and provide the same amount of force after repeated use. 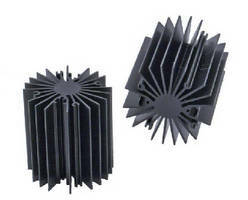 The MV/MA 302 heatsink can be supplied in custom lengths and customers can specify the number of spring clips they want. 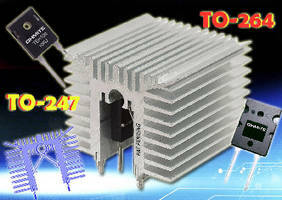 Designed originally for the Ohmite TEH70, TEH100 and TFH85 resistors customers using any active devices in TO-247 or TO-264 packages will benefit from this heatsink. MA/MV heatsinks are designed to mount 2 or 4 devices and prices range from $5.00 to $10.00 depending on quantity and surface finish. Product details can be viewed at www.ohmite.com/catalog/pdf/m-sink.pdf. In business since 1925, Ohmite Manufacturing is a global supplier of fixed and variable power resistors as well as heatsink solutions and electronic hardware. For more information on Ohmite products and local distributors go to www.ohmite.com. Radial-Fin Heat Sink Extrusions target LED light engines. 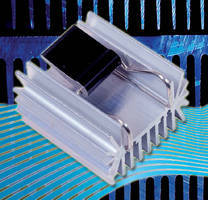 Adaptable Heatsinks accommodate TO-264 devices. Heatsinks are designed for TO-264 devices. Aluminum Heatsinks incorporate extra fins on rear. 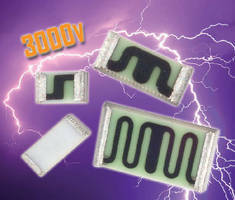 Thick Film Chip Resistors handle up to 3,000 V.
Fan/Heatsink Assembly features six embedded heatpipes.